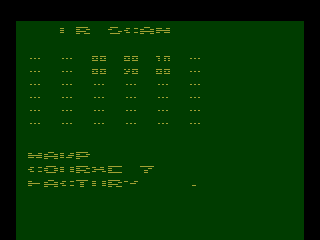 Stellar Track is based off the old text Star Trek game that was popular on college mainframes in the early 70's. 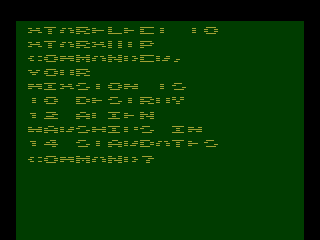 Since the 2600 doesn't have a built in character set, a interesting trick is used to display a full screen of text using regular graphics. The letters are not solid, but instead are made up of alternating lines. This trick called "Venetian Blinds" allowed the 2600 to display up to eight sprites per row (instead of the normal six) by alternating them between two sets of scanlines (four on one set of scanlines, and four on the other). However this technique doesn't show up well in screenshots since only half of the letters are there when the picture is taken. Stellar Track is a unique text based space simulation that often gets overlooked. The game play revolves around hunting down and engaging enemy war ships around the galaxy. The galaxy is made of up 36 quadrants with 64 sectors each that player must scan to locate enemy ships. 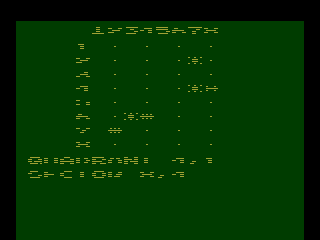 Once the player warps into a sector, an 8x8 grid is displayed showing the locations of each ship. The player must then engage and destroy each enemy ship in the sector by issuing text commands like an RPG (raise shields, fire torpedoes, etc.). The player must also manage the well being of the ship's systems such as the torpedo launchers, long and short range scanners, and engines. Think of it as an all text version of Star Raiders. Stellar Track was programmed by Atari (under the name Stella Trek) but was only released under the Sear Tele-Games label as one of three exclusives. This was part of the deal Sears made with Atari when it agreed to start distributing their games under it's own label. While Stellar Track was vastly overshadowed by the flashier action games of the time, it remains one of the few true strategy games on the 2600. Stellar Track is a little slow paced, but worth a try.